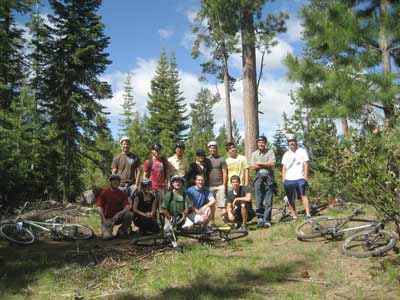 I recently planned a long 21 mile mountain bike ride in Bend, Oregon for a family reunion. The ride was awesome, but I found that planning the route took much longer than expected. I searched the web for hours and hours before I even began to find useful trail information. I finally found good resources, but it wasn't easy sorting through all the static in Google's search results. But now that I have found the best resources for maps and trail information, I decided to depart from my normal tech-related posts and write something that hopefully saves others a lot of time when planning outdoor activities in Bend. Whether you'll be hiking, biking, cross country skiing, horseback riding, etc, here is the map and trail information I wish I would have easily found when I was planning my activity...pocket maps, gps data, trail descriptions and ratings, etc. Most of the information is free. Phil's Trail Network - There is a specific trail called Phil's trail, but it is only one trail among many in the entire network of connected trails in the area. There are literally hundreds of miles of trails to be explored. It would be easy to get lost amongst all the trails if you aren't properly prepared with trail info. Deschutes River Trail - A great trail that follows a portion of the Deschutes river and provides several views of falls. Bend is well known for these great mountain biking trails. You are free to choose any route you want (with only one or two exceptions where a trail is one direction only). One option is to start at Phil's trail head and go for an out-and-back ride which will involve uphill on the way out and downhill on the way back. Another option if you want mostly downhill is start start at the Swampy Lakes parking area and choose your own route down to Phil's trail head (which provides over 2000 feet of decent). The trails are great for all levels of experience, from beginner to advanced. The trails are well maintained by COTA and are mostly nice smooth single-track. Some (but not all) of the trail heads and parking areas near Bend require a day pass / parking fee from the US Forest Service. 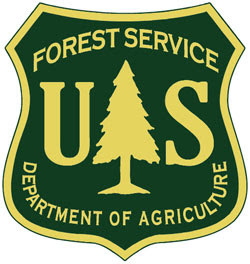 The US Forest Service map linked to below shows which trail heads require a pass and which ones don't. Some of the trails in the higher elevations are still inaccessible in early summer due to snow levels. Local bike stores (like Pine Mountain Sports), US Forest Service, and others can give current conditions if you need them. The Flagline trail (which can be seen on the US Forest Service map) is only open after August 15 due to elk migration. The North Fork Trail is for uphill riding only...no downhill. This is one of the few trails where you are forced to go one direction. Of all the resources below, I found that the GPS/Google Earth data from Oregon Mountain Biking (ormtb.com) was the most useful for getting familiar with the trail names and locations. 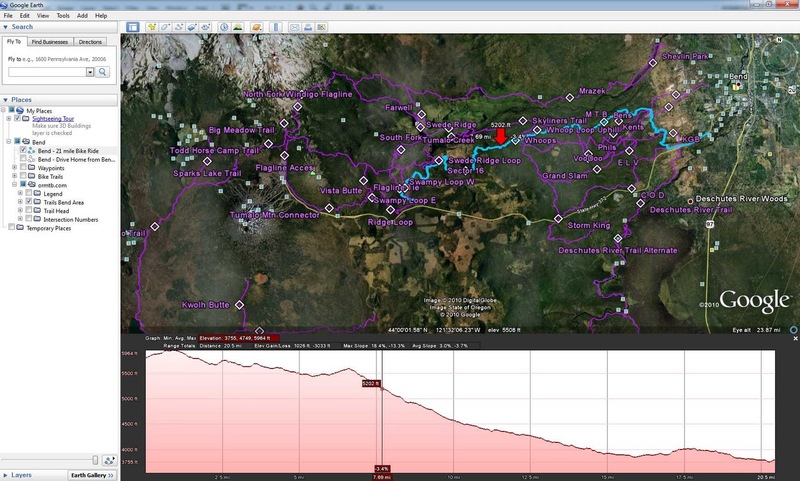 Google Earth is an invaluable tool for visualizing trail locations and planning a route. It is also great to be able to load the data on your own GPS so you can have it with you during your ride (in addition to a paper map of course). Screenshot of Google Earth displaying almost all the mountain biking trails in Bend, Oregon. See information below for downloading the Google Earth KMZ file with this data. Bend and Central Oregon Trail Information - ORMTB's main page for Bend and Central Oregon trails. 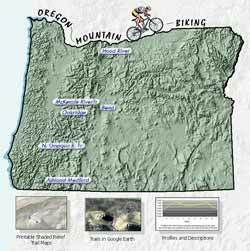 Central Oregon Overview Map - An overview of areas around/near Bend that have mountain biking trails. Phils trails 8.5 x 11 Pocket Map - This is a link to a PDF document that has a nice map of Phil's area. This is the first of 3 maps I found really useful. Google Earth KMZ File - This was the most valuable resource for me. This is a link to the Google Earth KMZ file that has trail info for most of the main trails near Bend. In Google Earth, you can gather and view all sorts of information (elevation profiles for routes, measure route distances, etc)...great for planning. 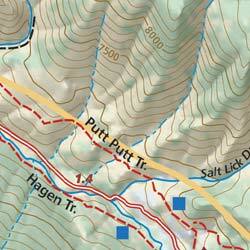 Tumalo Trail System Map (includes Phil's area) - This is a link to a PDF file containing a map. This is the second of 3 maps I found really useful. Individual Trails and Maps - This is a list of trails near Bend with information on distances, trail conditions, type of trail (bike, hike, horse, etc) and with trail maps for many of the individual trails. Adventure Maps, Inc. makes the definitive map of the area, but this one will cost you about $12. If you want a really good detailed map of the area, I highly recommend it. You can order it online and you should also be able to find it in most of the bike stores in Bend (I got mine at Pine Mountain Sports). It is the third of the 3 maps I found really useful. Here are some highlights of the map. "The Bend, Central Oregon Mountain Biking and X/C Skiing Adventure Map is a waterproof, topographic map that includes a route guide covering trails throughout Bend, Sisters, and all of Central Oregon. This map provides full beta for mountain biking trails in the Phil's Trail System in Bend and the Peterson Ridge System in Sisters. Wyman's site doesn't show up in too many Google searches but I found it to be really useful. Donald Wyman has put in a lot of effort to describe and rate almost every single trail near Bend. He also gives suggested loops/routes. This site was created and funded by the Bend City Council. I didn't use this for any of my planning, but it does look like they have some good trail information. It looks like a good site in general if you are going to visit Bend; they have information on skiing, snowboarding, golfing, fishing, hiking, biking, rafting, and other activities. Please leave a comment if I've missed a valuable resource that you think I should add to the list. 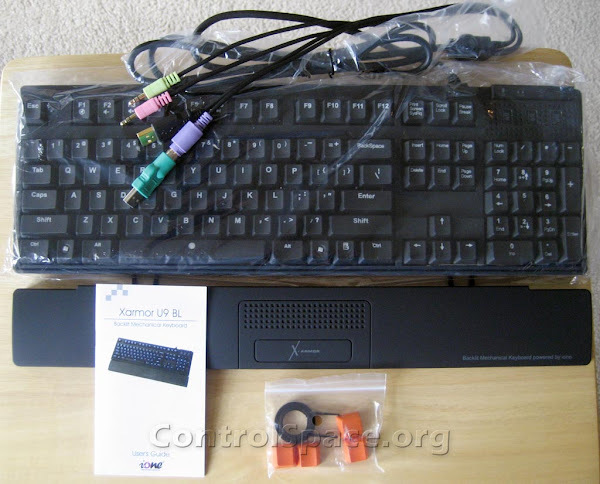 This is a review of the XArmor U9BL mechanical switch keyboard. In the review, you'll find quite a few pictures (50+) and some of my impressions of this keyboard after using it for about 5 days. Unlike the typical review process, I'll also be sure to check back in at some point in the future to give my longer term impressions about the durability and quality of the product. The review provides a brief background of mechanical switch keyboards and what led me to this purchase, then proceeds to the the features, packaging, construction/quality, and my general impressions of the keyboard. 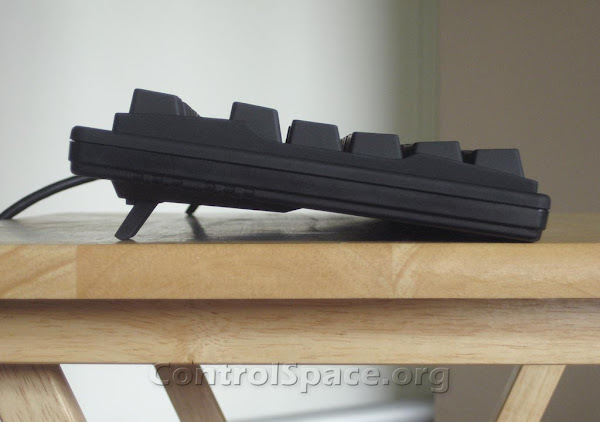 Update (1/27/2011) - As promised, here is my quick update on how the keyboard is holding up over time. After about six months of using this keyboard, I can say that I have been very happy with the keyboard. It has held up very well and there are no signs of wear with the rubber coating. I should note that the keyboard saw moderate to heavy use during its first 2-3 months when I was out of work and using my home desktop as my main computer, but now that I'm back at work it only sees light use during the evenings after I get home from work. Also, I only occasionally use the keyboard for gaming so it doesn't get heavy use in that department either. Depending on how you would use the keyboard, your mileage may vary but I've been impressed with the keyboard so far (although the novelty of the backlight has warn off and I never use the backlight anymore). I will also note that it looks like XArmor is now selling a cheaper version of the keyboard without the backlight so if you don't think you'll ever need the backlight, the cheaper version may be the way to go. Note: I decided not to include all 50+ pictures in the main body of this review (I only included 20), but I did create a public web album with higher resolution versions of all the pictures I took. I had been needing to replace my flaky wireless keyboard for more than six months, and I'm actually glad I put off buying a replacement until last week. 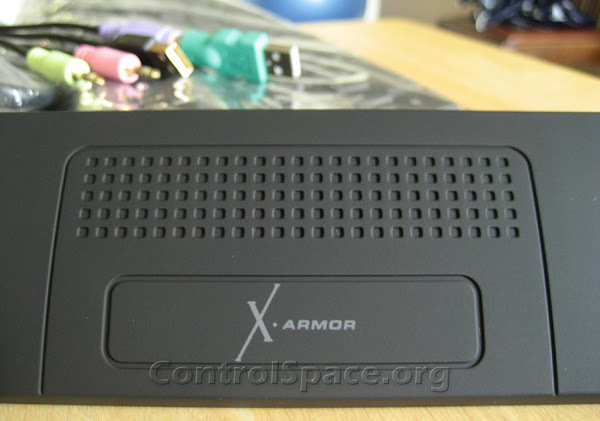 If I had not waited, I wouldn't have the keyboard I do now...the XArmor U9BL. 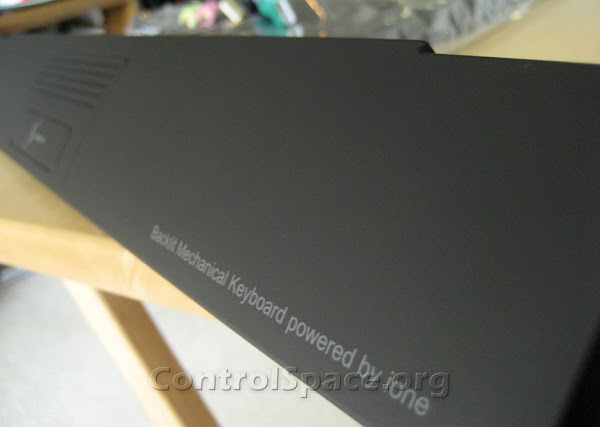 That is because the XArmor U9BL, made by iOne, only just started selling at the end of July and it was pure coincidence that this keyboard was released around the same time I started searching for a new one. I had been reading review after review of Microsoft and Logitech keyboards and just wasn't seeing anything that was feature-full, well built, and reliable. Complaints about those keyboards included things like the lettering on the keys wearing off quickly (which can be common), certain keys not working after a few months, and even specific key combinations not working within games. There are always going to be negative reviews of products on the internet, but my general sense was that keyboards are not being made like they use to be. You know the saying...you get what you pay for. My frustration with the quality of keyboards eventually led me to some interesting forums discussing the virtues of mechanical switch keyboards. I was not a stranger to mechanical switch keyboards, but I had not used one for quite a few years (the last one being a classic IBM Model M keyboard that I grew up using). I had been using rubber-dome keyboards for so long that I guess I had assumed these "vintage" style keyboards didn't really exist anymore. 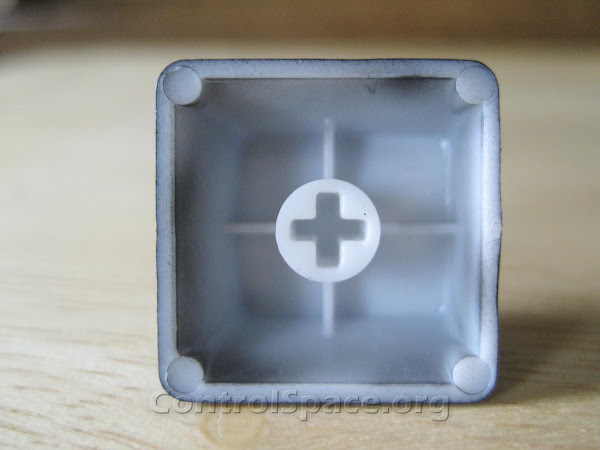 If you're wondering what a mechanical switch keyboard is and how it differs from rubber-dome keyboards, here are a few links that will explain the differences and the types of mechanical switches available (Cherry MX, buckling spring, Alps, etc). There are other cheaper ones available but most reviews indicate that they suffer in the quality department. Mechanical keyboards also come in other layouts and form factors like the tenkeyless design. I use the number keypad all the time, so I don't even consider the smaller form factors. The keyboards above are in the $125 and higher range. Most people may not be able to justify the cost of these keyboards, but it is a shame that a device we use every day to interface with our computers is often cheaply made and provides a horrible typing experience. For this and other reasons, I decided to splurge and get the XArmor U9BL. A nice view of the clean-edged lettering on the laser-etched keys. 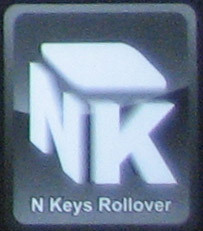 N-Key Rollover - I haven't mentioned this yet, but you can reference this post for more information on this feature. 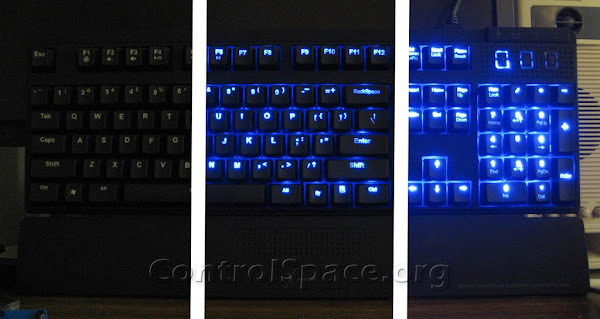 For me, backlighting wasn't a necessity, but there were a few occasions with my old keyboard where I would have liked this feature. The Deck Legend is the more sturdy keyboard weight-wise, but the XArmor includes additional features I knew I would use (built-in USB hub, media keys, audio/mic pass-thru, etc). 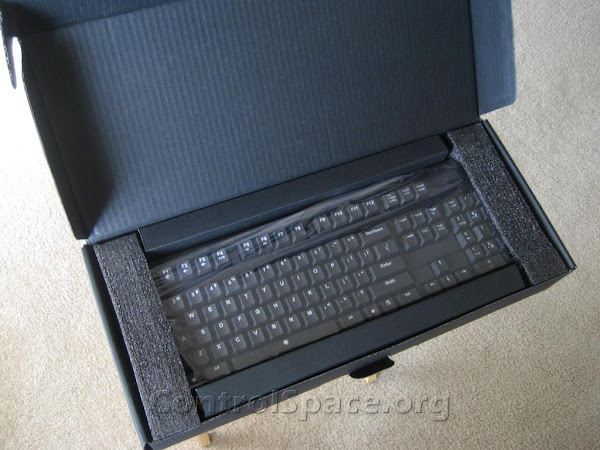 The XArmor keyboard comes in fairly standard packaging. No complaints here. Manual - The front cover shows that the escape key has a red LED, but it doesn't. I would have actually liked that. This keyboard looked good from the pictures I saw, and it looks just as good in person. It has a nice clean standard layout and it has a rubber coating that gives it a nice soft, diffuse look. Here are the audio/mic and USB cables...some of which are pointlessly plated in gold. The ps2-to-usb adapter comes already attached. Last of all, here are the extra key caps and the key puller that were included with the keyboard. I haven't taken apart my keyboard yet (other than removing a few keys), so I'll refer you to the XArmor trial run sample review for pictures of the keyboard's internals (soldering, components, etc). They have some great pictures that help give an idea of the internal build quality. One thing I noticed when removing the keyboard from the packaging was the solid feel. The keyboard weighs in at slightly over 2.8 pounds, which isn't as beefy as a Deck Legend (3.5 lbs.) or Model M (5-6 lbs.) but it is better than the average keyboard. My old wireless keyboard which was larger than the XArmor weighs less at 2.1 pounds. While weight shouldn't be the sole factor in determining build quality, the weight of this keyboard did give me the impression that this was a solidly built keyboard. There seems to be a trend with gaming keyboards (I'm thinking Razer Lycosa and other keyboards) to use rubber-coated keys. In the case of the XArmor, pretty much everything is rubber coated except the bottom of the keyboard. You'll find it on the top and side surfaces of the keyboard, the keys, and the wrist rest. There is a definite tactile difference between the feeling of the coating on the keys and the rest of the keyboard. The wrist rest and other surfaces of the keyboard have a nice soft/smooth feel to them, while the coating on the keys has a slightly rougher/harder feel giving an impression of greater durability. The long-term durability of the rubber coating concerns me a little bit, but that is only a concern that can eased over time if the keyboard holds up well. I've seen several people complain about the rubber coating peeling off the keys on the Razer Lycosa, but that keyboard may use a completely different type of coating and/or process for applying it (which is the impression I get after looking at pictures). I don't want to give anybody the impression that the coating will peel, but it was a concern I had before buying the keyboard. It is less of a concern now that I've had a chance to see the keyboard and type on it for a few days. And if it does turn out to be a problem, hopefully it would be covered under the one year warranty period. "The keycap on XArmor U9BL is molded with translucent material and then coated with soft black rubber coating and finally with laser etched on the characters. Very similar to what they do on most cellular phone." "I've missed one thing, the key cap has a final clear UV coating on them, so it will prevent the key characters from wearing out." The only other thing I want to touch on in terms of the coating (which is going to be a little nit-picky) is the slightly uneven application of it on some of the keys. The picture below shows one of these keys. The unevenness only ever occurs on the bottom half of the key, not the top, so it is barely noticeable when the keys are on the keyboard. Overall, the rubber coated keys feel and look nice but I imagine most people willing to fork out money for a mechanical keyboard would consider durability a higher priority. Even though the keyboard is rated for 50 million key strokes, you don't want the keys to be the lowest common denominator (again, this is just an assumption since the durability of these keys hasn't been proven yet). It would be great to see a version of this keyboard with dual injection molded keys (or dye-sublimation) and know that the key caps would last as long as the rest of the keyboard. 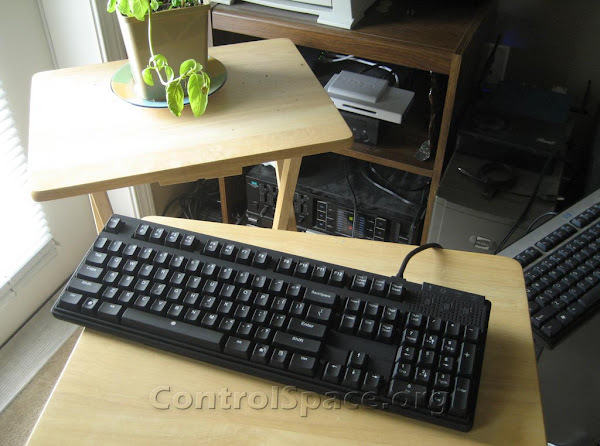 One of the main draws for this keyboard are the Cherry MX mechanical switches used for the keys (as seen in the picture below). They have a great reputation and they provide a very satisfying typing experience compared to rubber-dome keyboards. 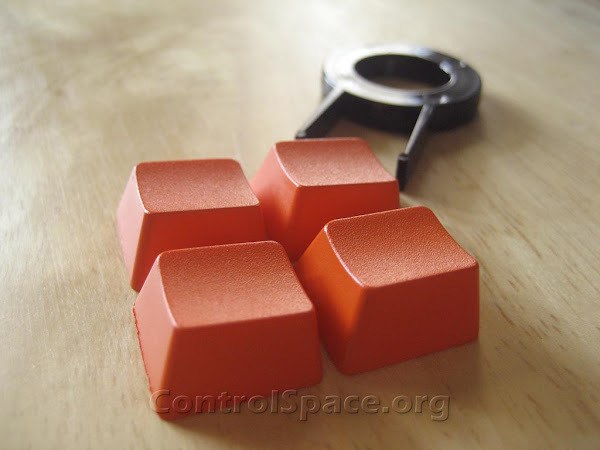 These switches come in various colors; each color varies in terms of tactile feel (linear vs non-linear force required to press the key) and noise (i.e. clicky vs non-clicky). 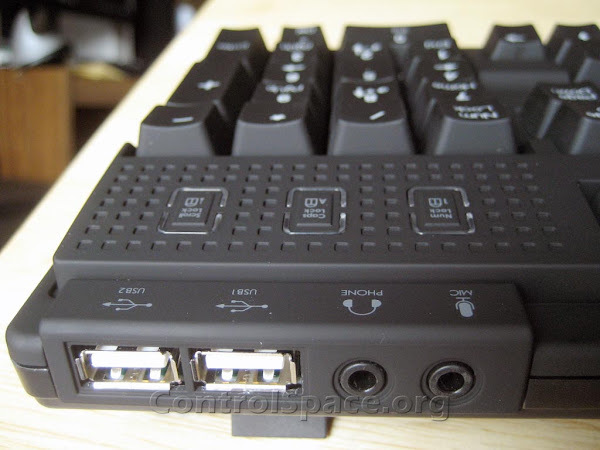 This particular keyboard uses Cherry MX blue switches which provide a nice "clicky", tactile feel for everyday typing. I like the clicky noise, but keep in mind that it is loud enough to where it could be an annoyance for other people that work around you. 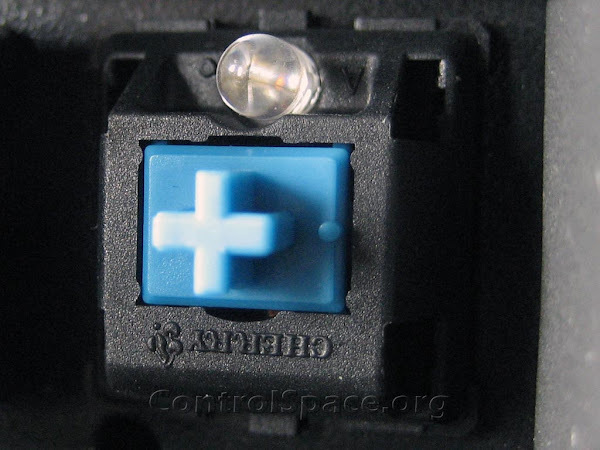 The blue switches were an interesting choice considering the keyboard is marketed as a gaming keyboard, because it is generally agreed among enthusiasts that Cherry MX brown or Cherry MX black switches are better for gaming (refer to the links at the beginning of this article for more detailed information on the difference between the colors). With that said, I am perfectly happy with the blue switches, but I'm not a heavy gamer. I hope XArmor continues to sell this keyboard with blue switches, but I do think they should provide this keyboard with at least one other switch color to appeal to a wider audience. In fact, XArmor is currently running a poll on their site to find out which switch people are most interested in if you'd like to vote and give your input. During my first ten minutes of using this keyboard, the thought that kept running through my mind was that it could take some time to get used to it. For example, one of the first things I noticed was that both Shift keys and the Backspace key felt much stiffer than the other keys. I'm not sure what is different about these keys, but they definitely require more force to depress and it was ruining my typing rhythm. However, now that I've been using the keyboard for five days or so, I think my fingers have adjusted because I don't really even notice the difference anymore. Even though switching to the new keyboard felt different at first, I can't say that it immediately felt better than my older rubber-dome keyboard that I had been using for so long. However, I recently tried typing on the old keyboard again and the new keyboard felt dramatically better in comparison. It reminds me of the switch from VHS to DVD. I didn't feel like there was a huge difference in quality moving to DVD, but after watching DVDs for a while it was really hard to go back to the lower quality of VHS tapes. Touch typists will enjoy the well placed and nicely raised ridges on the 'F' and 'J' keys on the home row. N-Key Rollover Test - I tested the n-key rollover functionality with both USB and PS/2 connections. Everything worked as expected. Key Chattering/Bouncing - Key "chattering" with mechanical switches is when one key press registers as multiple key presses. This usually only occurs if a switch is defective. There are simple tests that can reveal chattering and I didn't find anything wrong with the mechanical switches on my keyboard. 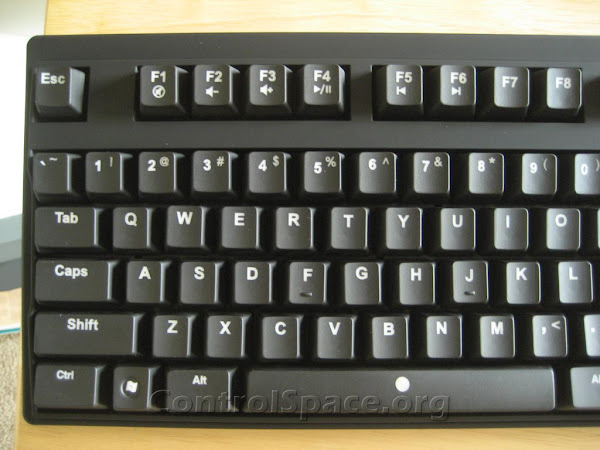 The media keys are located on the function keys (F1-F6) and they are activated by holding down the left Shift key then pressing the desired media key. The media keys work fine in Windows, but I do have a minor complaint with how they were implemented. Because the media keys require holding down the Shift key, the operating system sees a key combination like 'Shift+VolumeUp' instead of just 'VolumeUp'. Again, this works fine in Windows but it did cause problems with my media key shortcuts in Linux. I would have much rather seen dedicated media keys or at least media keys activated by a dedicated function (Fn) key, not the Shift key. If a function (Fn) key had been used instead, the only key stroke seen by the operating system would be 'VolumeUp'. I haven't run into any other problems yet, but this could also cause problems with shortcuts in Excel, Photoshop, or other software applications that use shortcut combinations with the Shift key and any of the first six function keys (F1-F6). Again, this is because the operating system would see something like 'Shift+VolumeUp' instead of 'Shift+F3' if a shortcut like that was used. I should note that this would only happen when using the left Shift key; the right Shift key behaves normally and doesn't activate the media key functionality. 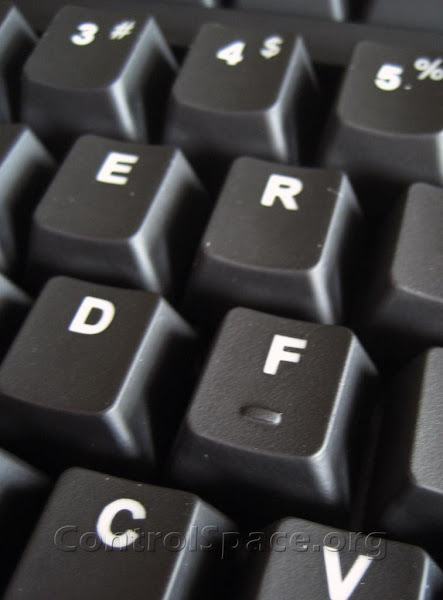 The media keys are located on the function keys (F1-F6). Replace either the right Windows key or the Menu key right next to it with a function (Fn) key. Or make the spacebar shorter and add a fourth key to the left of the spacebar like they do on laptops. 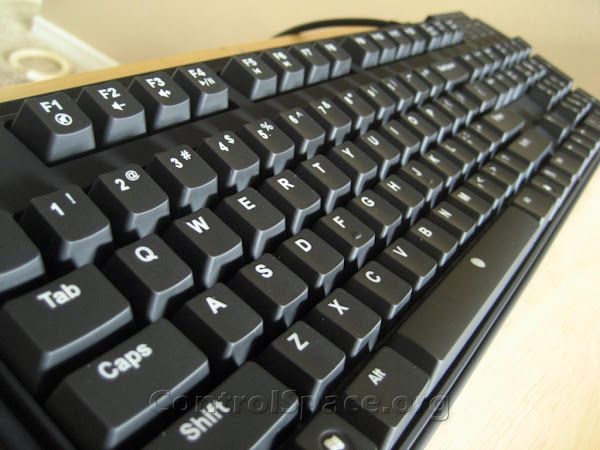 Another idea would be to replace the num lock, caps lock, and scroll lock on the upper right of the keyboard with four dedicated mechanical switch media keys (mute, volume up, volume down, and play/pause). To deal with the missing status LEDs, they could turn the keys themselves into status lights since they are backlit. For example, the Caps Lock could change from blue to green if it is activated. Same goes for num lock and scroll lock. Or they could just put smaller status LEDs somewhere else on the keyboard. Even better, and along the same lines of the previous idea. Replace the large status LEDs with a volume knob and 3 mechanical switch keys (play/pause, next track, previous track). Turning the volume knob would control volume up/down and then it could be made so that pressing down on the volume knob mutes the audio. That would give dedicated controls for all six of the current media functions by using 1 knob and 3 keys. 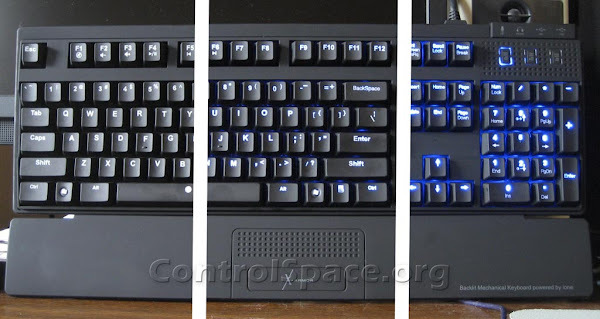 Again, the status LEDs could be integrated into to the caps lock, num lock, and scroll lock keys. (or 1 knob and 3 keys) if they decided to add dedicated media keys. Anyhow, I thought I would throw those ideas out there in case anybody from XArmor reads this post. I don't know what the perfect solution would be without adding too many more keys and bulk to the keyboard (I like the compact nature/design of the keyboard), but it would be nice if there was an improvement with the media keys. I just hope they don't remove the media keys altogether like Das did with their keyboards. 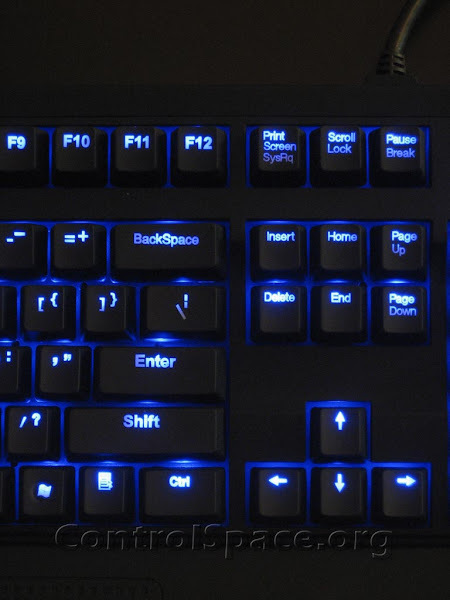 The XArmor keyboard is illuminated by blue LEDs located under every key. The keyboard doesn't feature multi-colored programmable LEDs like other keyboards but the illumination does have 8 levels of brightness control. The brightness is controlled by holding down the left Ctrl key in combination with either the up or down arrow on the number keypad. The following picture is a composite of 3 pictures taken at night. From left to right, the illumination is turned off, then set to level 1, then set to level 8. The highest brightness level doesn't have the street lamp glow look in person (I blame my camera), but the highest level is quite bright at night. Here is another similar composite image taken during the day at the same brightness levels. It is hard to tell from the photo, but the level 1 brightness is still sufficient for daytime use. As you can see, the highest brightness level shouldn't leave anybody wanting a higher setting. I found that level 1 or 2 brightness was the most comfortable for me. Anything brighter than that felt too distracting in my peripheral vision when I was focused on the computer monitor. Another thing to note is that there isn't much difference between levels 6 and 8. They are almost exactly the same. Overall, I'm happy with the backlighting, but I'll point out a few minor things that could bug some people. First, the larger keys aren't very evenly lit. As you can see in the picture below, they are much brighter towards the center of the key where the LEDs are located. Second, only the top half of the keys are generally lit well (which only affects a couple of keys). Again, the top half of the key is where the LEDs are located. The Print Screen key is a great example of this; SysRq hardly looks like it is lit up in person. These minor issues also explain why they printed/etched the dual character keys the way they did. Take the apostrophe/quote key for example. Most keyboards stack these character vertically on top of each other, whereas XArmor places them differently and makes one character the super-script of the other character. Integrated USB Hub - So far, I've tested the USB ports with USB mass storage devices and the Xbox Live Vision camera. Audio Pass-thru - I like the pass-thru design much better than keyboards that have built-in USB soundcards, like one of the Logitech gaming keyboards...yuck. I have the audio hooked up so I can use either my speakers or my headphones which are plugged into keyboard. In order to accomplish this, I just used a short cable to split the audio output on the back of my computer. My speakers get plugged into one side and the audio pass-thru cable from the keyboard gets plugged into the other side. Both my speakers and my headphones get the audio signal simultaneously so I don't have to move cables around when choosing one output option over the other. I mentioned at the beginning of the review that I was looking for a keyboard that was feature-full, well built, and reliable. As far as features, there isn't another keyboard that can boast every single feature this keyboard has (mechanical switches, LED illumination, integrated usb, audio pass-thru, media keys). As far as being well built, this is a solidly built keyboard with only minor issues (e.g. uneven application of rubber coating on keys, etc). As far as being reliable...I guess only time will tell. This is not a perfect keyboard and it might not meet everyone's requirements, but my typing fingers are thanking me for finally upgrading and making the leap to a mechanical keyboard. It is the first XArmor branded product to be released in the U.S. and I look forward to seeing other products from the company in the future. Street Price ($150) - although you won't find many mechanical switch keyboards with n-key rollover much cheaper. One last thing. In this review, I didn't include all 50+ pictures that I took so follow the slideshow below if you want to see all of them. They're all higher resolution versions (1024px) of the pictures in this review. Even if you are not in either one of these categories, this article may still be of interest to you since keyboards with n-key rollover are generally of higher quality. Most keyboards providing n-key rollover are of the mechanical key switch type as opposed to the rubber dome style keyboards which are, unfortunately, cheaply made and distributed with desktop PC's these days. However, I'll leave it up to another article and/or the curiosity of the reader to delve into the wonders of mechanical key switch keyboards. An excellent place to start is here. N-Key Rollover - The press of each key on a keyboard can be detected individually, which means that each key you press will be seen by your operating system no matter how many keys you are holding down simultaneously (hence the variable 'n' in n-key to refer to as many keys as are possible to press on a keyboard). Anti-Ghosting - This can refer to the ability of a keyboard to recognize 3 or more key presses at once. The main thing to point out is that anti-ghosting usually implies that there is a limit on which combinations of keys and how many of them can be pressed simultaneously, while n-key rollover keyboards have no such limit (except when using USB, see 'PS/2 vs USB Technical Limitations' below). The number of simultaneously recognized key presses varies between each model of keyboard that does not have full n-key rollover. 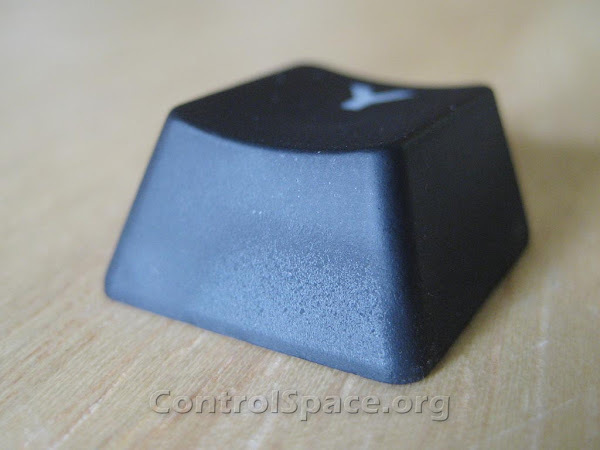 In some ways, you can think of anti-ghosting as an attempt by manufacturers to improve functionality of cheaply made rubber dome keyboards, without having to implement proper n-key rollover functionality. Technological Background Information - Even though this is on a braille-oriented site, skip to the section titled 'Technological Background Information' for an excellent discussion on n-key rollover (which most keyboards had in the early days of computing before keyboards became cheap commodity items). Wikipedia - Explanation of keyboard rollover. Microsoft Applied Sciences - Explanation of keyboard ghosting. In this case, after pressing the first two keys (Ctrl + W), the third key (R) doesn't register. 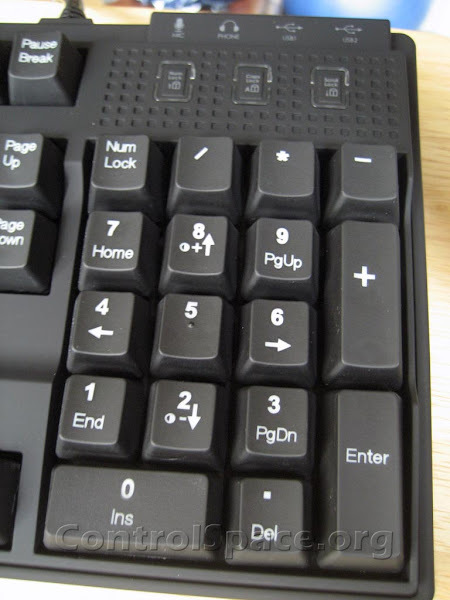 While key combinations like this may not be used by every gamer, it is a real problem...even with keyboards like this marketed towards gamers. Whether you are a gamer, a photoshop user, or power user of other software you may come across certain 3-key combinations/shortcuts that may not work. The circuitry in keyboards these days is designed in such a way that only certain key combinations work. Engineers optimize the circuitry so that the most common combinations will work, but the inherent drawback with the designs is that there will be combinations that just won't work. Again, I'll refer you to the Microsoft Applied Sciences article for a much more in-depth explanation. My intent is not to single out the Microsoft keyboard, but to demonstrate that you may run into issues like this if you don't have a keyboard that has full n-key rollover support. USB protocol limitation - A max of 10 simultaneous key presses are recognized, 6 non-modifier keys ('w', 'a', 's', 'd', etc) + 4 modifier keys (Shift, Caps, Ctrl, etc). Although you are limited to 6 regular keys you are still guaranteed that any combination of keys will be recognized properly if you have an n-key rollover keyboard. I would guess that most people would not need support for more keys than this. I would also guess that the 6 key limit may have had something to do with braille input requirements rather than someone choosing an arbitrary limit (although that doesn't explain why the limit exists in the first place). PS/2 - There are no limitations when using a PS/2 connection with your keyboard. You will truly get full n-key rollover support. When given the choice between using PS/2 or USB, it is generally recommended to choose PS/2 since it doesn't have the rollover limitations. 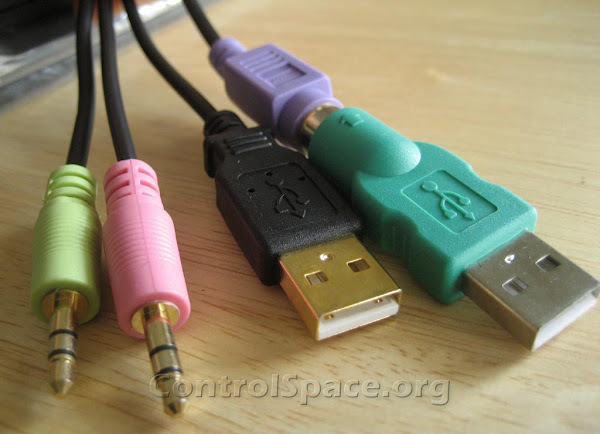 However, if you enjoy hotplug support which PS/2 doesn't have, USB may very well be the better choice for you. Here are several desktop applications you can use to test n-key rollover functionality. The first one is Linux-based while the remaining ones are Windows-based. 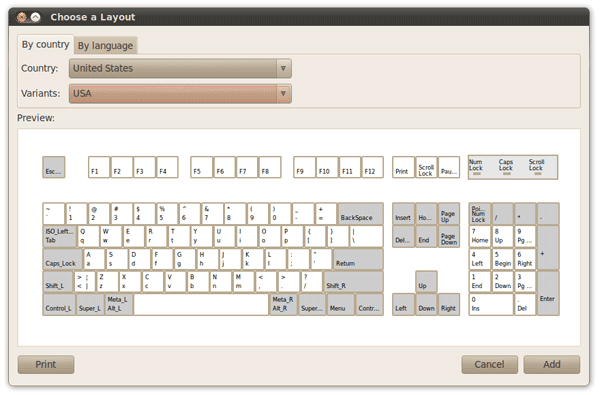 Once the keyboard properties window is open, go to the Layouts tab and click on the Add... button to open up the on-screen keyboard. Be sure to select the correct Country and Variant, then click within the keyboard area to start using it. If you regularly use Windows, you can still use the utility without having to install Linux. Just download an Ubuntu CD image (.iso file) from Ubuntu and either burn it to CD and run the Ubuntu desktop from the CD or install and run it from a USB stick...all without having to install Ubuntu on your hard drive. Further instructions for downloading and running it are on the Ubuntu website. 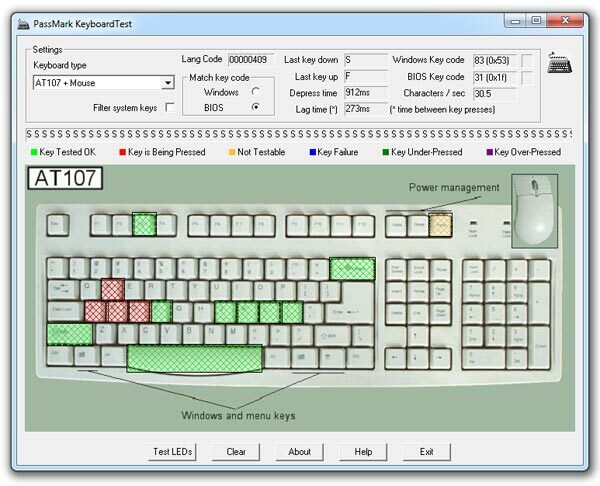 Aqua Key Test is a GUI application that shows an on-screen keyboard indicating the key presses that are being recognized. This is a small standalone executable that comes from Korea. 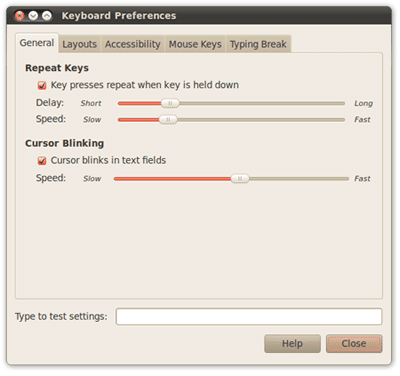 This is another GUI application that shows an on-screen keyboard indicating current key presses. However, this one is trial-limited to 30 days after which you need to pay for the software. You can go to the Passmark website to download it.